DEMBA graduate Muhammad Amjad attended the winter graduation ceremony in London. He tells us why Cass was the right place to pursue his Executive MBA. At a series of ceremonies held in London this month, Muhammad Amjad, joined thousands of students at the Barbican to celebrate the completion of their degrees. 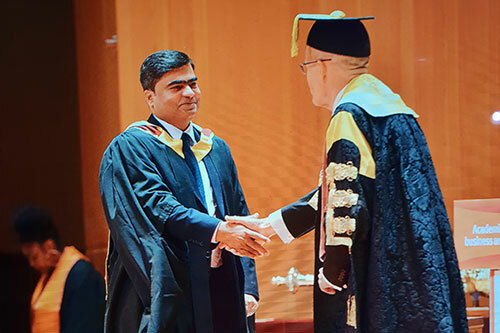 The Cass Business School graduate had completed his Executive MBA (EMBA) at the Dubai Centre – the University’s only offshore campus - and travelled to London to attend the graduation ceremony. For Muhammad, attending the ceremony in London was a “special experience and a wonderful way to celebrate the culmination of a rigorous but fulfilling two-year journey”. Working in the fashion industry for over a decade, Amjad had a great deal of expertise in operations and management consulting. However, he felt he lacked knowledge of business strategy, finance and the business of entrepreneurship. Studying for an EMBA was the best way to broaden his understanding of these subjects. Choosing Cass, he says, was the right decision for several reasons. The various International Electives on offer as part of the Cass EMBA provided Muhammad with the valuable opportunity to immerse himself in foreign business environments. “The London Symposium and the Silicon Valley electives were the highlights of my time on the programme. Through the Symposium, I was able to discover and understand the London way of conducting business and be inspired by innovative ideas. “The elective in Silicon Valley gave me the opportunity to interact with and learn from key players involved in the world’s most innovative entrepreneurship ecosystem.